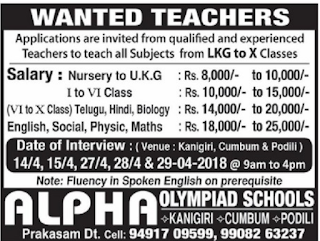 Alpha Olympiad Schools, Prakasam Dt has advertised in THE EENADU newspaper for recruitment of Teachers jobs vacancies. Interested and eligible job aspirants are requested to attend interview 14/4,15/4,27/4,28/4&29/04/2018. Check out further more details below. 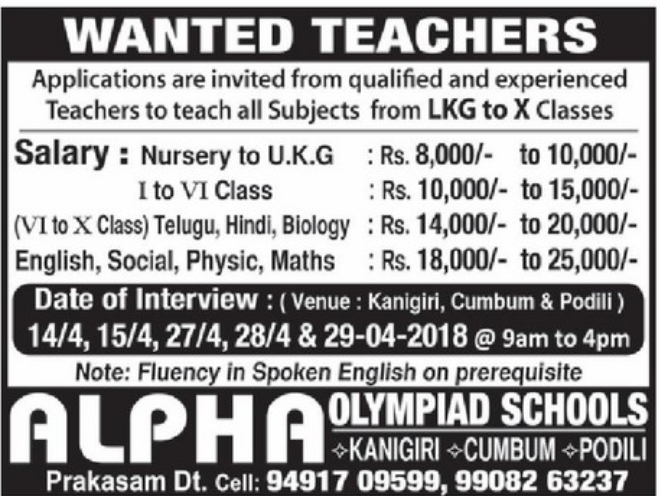 Name of the School: Alpha Olympiad Schools, Prakasam Dt. About School: Alpha Olympiad Schools, Pamuru-prakasam Dt is a co-educational institution. Fluency in spoken english on prerequisite.